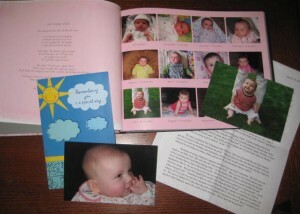 Example of one birth mother’s updates sent by adoptive parents. A Note from BirthMom Buds: We decided to set up this page for adoptive parents because we believe that open relationships between the adoptive parents and the birthmom/birth parents are best for the child. We hope that through our site and this page, adoptive moms have the chance to get insight into a birthmom’s heart. We are all in this for the same reason – the love of our child. Please respect that the main purpose of BirthMom Buds is to support birthmoms and women who are pregnant and considering adoption. Don’t make promises regarding contact during pregnancy (or anytime for that matter) that you are not certain you can keep. When you make promises and don’t keep them, it then causes us to question everything you promised us about how you’d raise our child. Please know that when we call our child “our child” on Facebook or in emails, we are not trying to undermine your role, we are simply acknowledging our relationship to our child. Contacting you, requesting visits or updates doesn’t mean we are trying to disrupt your lives or your family. We spent many sleepless nights making the decision to place our child with you and just want to be a part of our child’s life in some way. Photos and updates showing our child loved, happy, and healthy reaffirm that we made the right decision for them. Tell us how our child is doing. Tell us about his or her personality, what he or she likes & dislikes, and cute stories too. Talk to us about his or her eating habits, milestones, and other things that you might not think we would care about hearing. Most likely we will want to hear about it. We’re the only other people on earth who want to hear about how our child does everything! We want to be able to experience our child’s childhood through you. Though we love pictures of our child alone, we also want family photos. It helps us to see our child happy with his or her family. Pictures of the child in clothes we send or with toys or stuffed animals we send are awesome. Even if we get an acknowledgment that the item was received, it’s wonderful to see that item in use. When our child has his or her first haircut, we’d love a lock of hair. Pieces of artwork are treasured beyond measure. If the child draws a picture or even a scribble that you think no one else would want, we will treasure that doodle. Above all, remember that sometimes the things you write or what you include are not important. It’s the love we feel for us and between you and our child when we read the letters and see the pictures that’s priceless. Here are some links that may be helpful to you as an adoptive mom. Real Moms Newsletter (http://www.comeunity.com/adoption/realmoms/index.html) – An adoption newsletter for adoptive moms edited by Karen Ledbetter, an adoptive mom. Mom to Mom (http://www.momtomomchat.com/adoptmoms.html) – This is a support site for adoptive moms with a chat room, articles, links, and much more. Adoption Blogs (http://www.adoptionblogs.com/) – This site contains blogs written by different members of the adoption triad. It includes blogs specifically related to people hoping to adopt and open adoption. Adoption & Breastfeeding (http://www.babycenter.com/0_breastfeeding-an-adopted-baby_8482.bc) – This page discusses the option of breastfeeding adopted babies with suggestions and links.